So the last few days have been dedicated to Contemporary Romance. 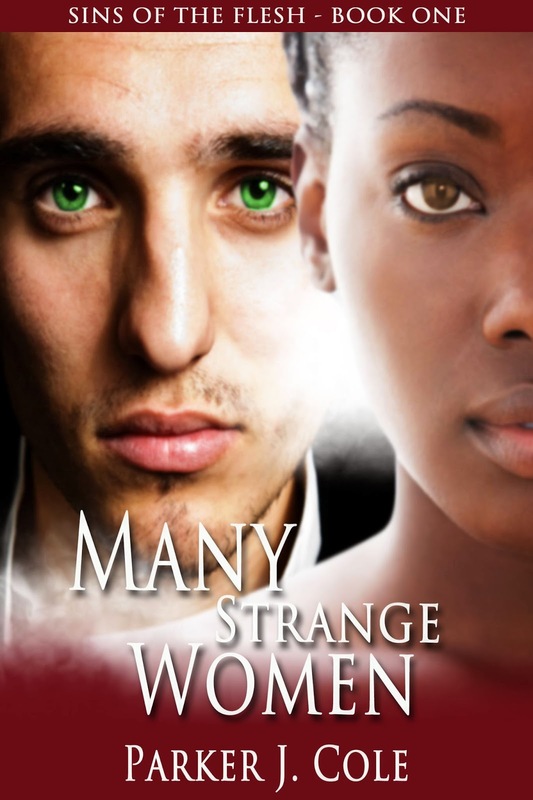 Today we're switching gears to welcome Parker J. Cole and her inspirational romance Many Strange Women. Before we talk shop, Parker has a few words on her 'rise from the slushpile'. Take it away Parker ! I think the word 'slush' isn't the right word I want to use in this journey on the road to publishing. The word is 'remains'. The remains of a poor helpless animal bitten by numerous bears that nipped at my flesh and left my carcass lying there in a heap in the middle of the forest floor. Yeah, ‘remains' is a good word. That is exactly how it felt on this road to publishing. There I was-a lithe, agile deer with my dreams of publishing my book a simple, seemingly attainable idea. All I would do is present my work to the first publisher and I would get recognized in an instant. With my trusty rabbit--er, um agent, who's a smooth talker and faster than I with negotiating the trail, we set off. The first publisher we came across bit gently into my hind leg. It hurt but she didn't draw blood and I still had my pride. We continued forward on the trail. Some publishers never responded. Others swatted at us like nuisance flies. Still others roared at me like I was a lunatic. Each rejection that came cut at me in some way. Pretty soon, I was a dragging myself along the trail, head down, self-confidence somewhere behind me on the forest floor. Yet, through this journey, my agent never stopped believing in me. My family knew it would happen and told me to be patient. My mate pushed me back up with his antlers and told me quit tripping out. The mate's never been good at soft encouraging words. I remember one rejection was particularly cutting to the point where I looked down at myself and wondered, "What in the world was I thinking!" When it finally happened, when a publisher offered me a contract, I was not the whole, lithe agile deer I had started out. In fact, my body was riddled with holes from the bears that scratched at my pride and belief. In fact, by the time it happened, when my turn for yes finally came, I did not believe it. --Each rejection that tore into me created a wound. But let me tell you, wounds heal. --The writer's journey does not have to be a lonely one. Always bring your friends and family with you. --Whatever doesn't kill you makes you stronger. Ain't that the truth? --Do not give up. Ever. Solomon Greene made a deal with God--If He'd send him an unattractive woman, he'd marry her on sight and do what was spiritually right by God. After all, he needed an ugly wife to help him escape from his past. Celeste Martin made a deal with Solomon. She'd be his ugly wife. All she wanted in return was his name. She was in love with her sister's fiancé and he would be the only man she'd ever love. Solomon had no idea that he'd find his wife fascinating. Celeste didn't know that one taste from her husband's lips would have her wanting more. Yet many strange women were between them. Could Solomon ever escape from his past? Could Celeste ever love her husband? Parker J. Cole is a writer and radio show host who spends most of her time reading, knitting, writing, cooking, and concocting new ideas for stories. Her first novel, Dark Cherub, won Best of Spring Reading 2013 from eMediaCampaigns. She lives in Michigan with her husband and their beloved dog, Sarah. Visit her website at www.parkerjcole.com. Glad that you made it Parker!!! Whooo! !